A decade has passed by but Nazir, a middle aged banker, still frets at the mention of a November morning. The branch, then, lacked space for storing such a ‘huge’ amount. They kept Rs 35 lakh inside the strong room and rest was stuffed into iron trunks. Minutes after Nazir and his colleagues were done securing the cash there was a loud bang on the main entrance. “I couldn’t get it at first. But when I saw men with AK47 rifles, I knew it is time to hide,” recalls Nazir. A few months back armed assailants had managed to flee with Rs 50 lakh cash from the same bank branch. However, both the robbers were gunned down when they accidently ran into a Rashtriya Rifles siege, while fleeing. The money was recovered. After that incident a police picket was installed inside the Imamsahib bank premises. But Nazir knew that one cannot rely on luck always. “That bunker should have been outside the main gate of the branch. Instead, they were stationed inside the hall. Which was of no use,” says Nazir. As soon as the eight armed men barged inside the hall, they started looking for the manager. But when they couldn’t locate him they dragged Nazir out from under his desk. “I tried my best to fit under my work table but…,” says Nazir. They had just one question for Nazir: where are the strong room keys? When Nazir told them that he does not have authority to carry keys, they began to beat him. Hearing cries, one of the cops, a young recruit from Pulwama, came running from inside the inner room to check what is happening. He was carrying no weapon. Neither was he wearing any uniform. “We used to call him Veerapan because of his appearance. I still remember he was not feeling well that day. He was wearing a Pheran,” says Nazir. “I have no idea,” said Veerapan. There were two gunshots, followed by a huge thud – a one that says something solid has fallen on the cement floor – and Veerapan was lying on the floor in pool of blood. “I had never seen somebody getting shot. Not even during peak militancy times,” says a visibly-shaken Nazir. After killing Veerapan, the gunmen called out for the manager. They warned him to come out of the hiding or everybody will be killed. “Our manager was hiding among the people. But once they killed Veerapan, he had no choice,” says Nazir. Once out, the gunmen asked manger the same question they had asked Nazir and Veerapan: where are the strong room keys? The manager tried his best to convince them that they had moved cash to the Zonal office in Pulwama a few days ago. “It seemed the gunmen had solid information about our cash. When the manger did not budge they shot him in the chest,” says Nazir. With both Veerapan and manager down, gunmen pinned their hopes on Nazir again. “Instead of letting them beat me again, I decided to run,” says Nazir. For next five minutes all Nazir and other men could hear were uninterrupted gunshots. They had no idea what was happening inside the main business area. “Later I came to know that the gunmen had shot manager again and taken the keys. They took away Rs 35 lakh from the strong room,” says Nazir. But Nazir acknowledges that since November 2004 a lot has changed on security front. “You have not improved alarm systems in place. And CCTV’s have made things lot more easy,” feels Nazir. Imamsahab attack was perhaps one of the last major bank robberies. During 1990s, when militancy was at its peak, Kashmir was a difficult place to operate for businesses including banks. The increased number of bank robberies, dacoits and arsons created a situation where people associated with this sector started fearing for their lives. There are no official figures available but according to well placed sources, between 1990 and 2001 an amount of Rs 8,60,52,700 was robbed from different banks in Kashmir. The fate of the nationalised banks operating in Kashmir was left in dilemma when Pandits, who would run most of these banks in the valley, migrated en masse to Jammu and other parts of India. 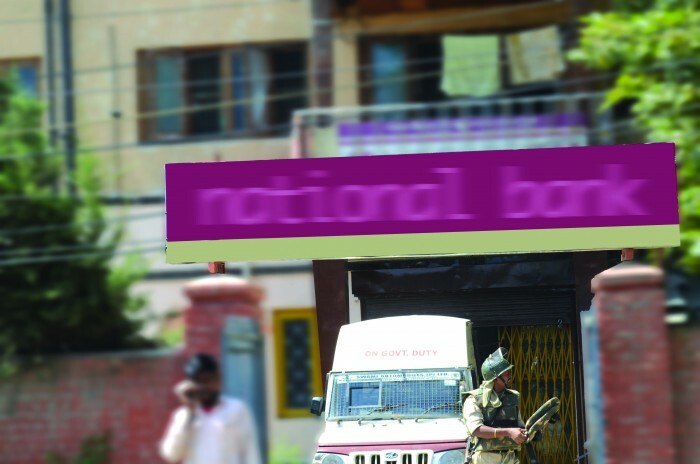 During those troubled times, even PNB, one of the better doing banks in J&K, closed and relocated its 14 branches to safe locations. Same was the case with Andhra Bank, the State Bank of Patiala and Indian Bank. These banks ceased their operations in Kashmir and relocated to Jammu. The threat was so palpable that even Reserve Bank of India (RBI) and NABARD closed down their offices in Kashmir and resumed operations from Jammu. In September 2001, during a meeting with then Finance Minister of India Yashwant Sinha, banks had agreed to appoint ex-servicemen as security guards. Following the meeting J&K Bank appointed 370 ex-servicemen and handed over the entire security of the bank to them. It was also decided that the state police and paramilitary forces will ensure the safe movement of cash. Nothing much is known about the investigations that were carried out by the police subsequently. Information available suggest that barring a few cases in which cash starved militants were responsible directly, some of the sensational robberies were planned and carried out by individuals who operated from the secured accommodations in Srinagar. Police made lot many arrests and then they use the maze of law to come out and stay relevant – all in national interest!